I met my husband in the basement of the boarding house where I was living in college. I know it sounds weird, but it’s true. I came home from visiting my parents and found a van parked in my spot. I huffed into the house prepared to give someone a piece of my mind and heard music coming from the basement. This was not unusual, as one of the other housemates, Paul, was an itinerant drummer. I reasoned that Paul was rehearsing with a new band, so I marched down the stairs to ask whoever that was to move their vehicle so I could park and came face to face with my future husband: the most handsome bassist I’d ever seen. Oh those blue eyes… He stayed for a cup of tea after rehearsal and the rest is history in motion. I got the soundtrack to my life marrying him and he got a permanent adoring audience. 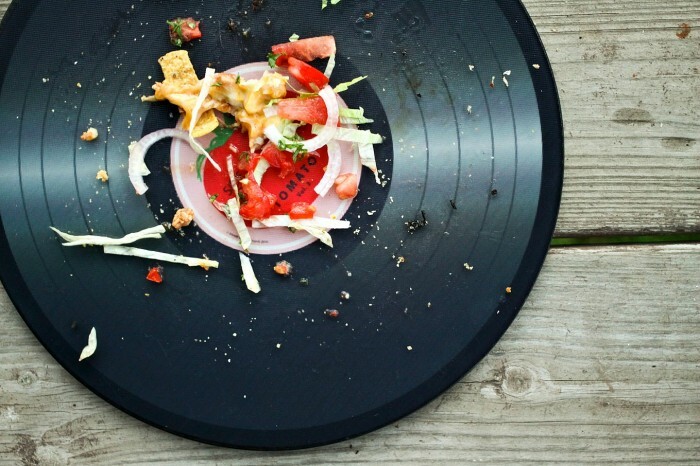 Just as much as music has helped define our relationship, so has pizza. We are both home bodies, so our standing ‘date night’ has been to make a tasty meal together. More often than not, that meal has been homemade pizza. 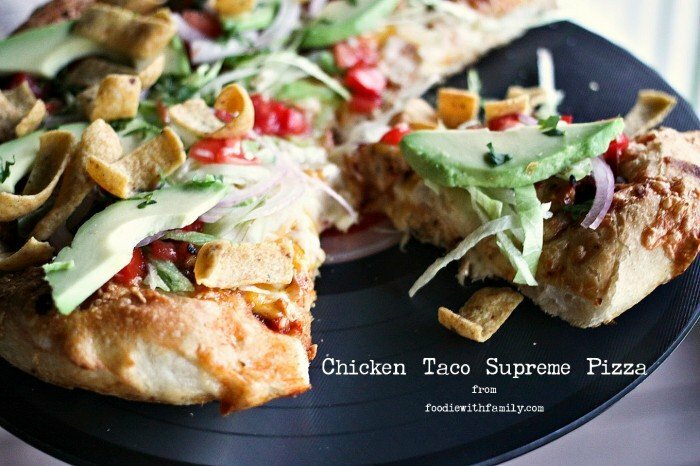 We have made some crazy combinations over the years, but this Chicken Taco Supreme Pizza is a mash-up of our best beloved pizza tradition with one of our other favourite foods: tacos. Honestly, if we could do so and remain healthy, we would quite likely subsist on pizza and tacos. 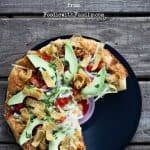 This chewy crust, pan style pizza is topped with shredded chicken tossed with hot sauce (or taco sauce, if your tastes run mild), and three different cheeses, baked, and then hit with all of your favourite taco toppings. In our case, that means shredded lettuce, chopped tomatoes, thinly sliced onions, avocados, fresh cilantro, and Fritos. Yes, Fritos. Fritos are TOTALLY the food of love, my friends. Take it from this old Sadie-Married-Lady; if one of you has corn chip breath, the other must, too. For best results on this pizza, please use the dough and method from The Best Pan Pizza post. It is the perfect vehicle for all those toppings! The BEST chicken to use for this recipe is leftover Slow-Cooker Sriracha Honey Barbecue Chicken. In that case, you don’t have to do anything other than add a few dashes of hot sauce and it’s ready to go. Another good choice is Slow-Cooker Shredded Chicken for Recipes. If you use the second option (or another fully-cooked shredded chicken) you’ll want to toss it with hot sauce and/or taco sauce to taste to keep it moist while baking. Keep in mind that you want to let the pizza cool for a few minutes before hitting it with your taco toppings. The reason for this is that you don’t want all your lovely fresh vegetables to wilt! Speaking of vegetables, when it comes to taco pizza, I make like my mom and use iceberg lettuce. I love the crunch it provides. Save the fancy pants lettuces for your salads- you need some oomph here! Divide the shredded chicken evenly between the two pans of dough and spread it around. Sprinkle each pizza with a 1/2 cup of the mozzarella, 1/2 cup of the Cheddar, and 1/2 cup of the Pepper Jack cheese. Bake for 12 to 20 minutes, depending on how done you like your pizzas. Remove the pizzas from the oven and use a flexible spatula to ease around the edges of the pizza, then use it to gently scoot under the pizza and transfer it to a cutting board. Let it cool for at least 5 minutes before slicing. After slicing, top with the shredded lettuce, tomato, onion, avocado, cilantro, and Fritos. Serve immediately. If you have leftovers, they store best if you remove the chips and vegetables. You can reheat the pizza and re-top with leftover vegetables! What is one interest or hobby that defines you? This giveaway is open to US Residents age 18 or older. Winners will be selected via random draw, and will be notified by e-mail. The notification email will come directly from BlogHer via the sweeps@blogher email address. You will have 72 hours to respond; otherwise a new winner will be selected. The Official Rules are available here. This sweepstakes runs from 8/25 -9/22/2014. Be sure to visit the JCPenney brand page on BlogHer.com where you can read other bloggers’ posts! I met my husband in a nursing home! Neither of us were residents; he was a consultant and I was the office manager. One of my hobbies is gardening, I love serving fresh veggies to my family. I met my husband at a singles activity for our church. We also love making homemade pizza together! My family would go nuts for this pizza! I met my husband on a blind date. His boss’ wife and I grew up together. I cancelled on him the first two dates. Luckily, he was persistent. We’ve been married 23 years! I met my husband when his roommate asked me to a party at their place. We started talking and never stopped. We have been together for 34 years. I guess baking is my hobby; I love to bake special treats for others, and am often requested to bring baked goodies to events. I could use that gift card on some awesome baking supplies!!! That server is spectacular. Totally caught my eye and I scrolled back up to check it out. I thought you had sacrificed an actual album for a great shot! what a find! I met my husband through a blind date set up by my college friend. My husband was the singer in the band that played at my best friend’s sweet 16 birthday party. 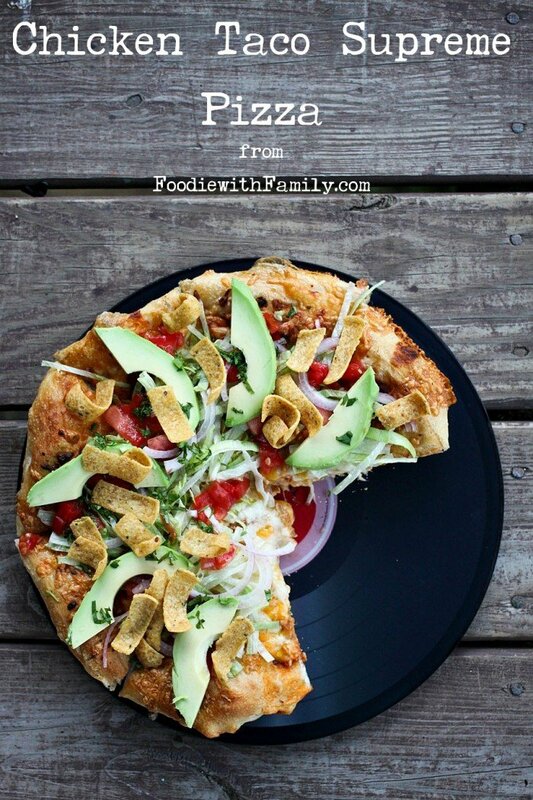 What an awesome pizza idea, love this!! I met my current girlfriend at work. I met my husband at the Drive-In with some friends. My husband and I met at a 7 Eleven. He was on a ladder and I looked up him and said “Hey there Boubie”. He responded with a “Hello there Boubala” and the rest is history. I met my hubby in high school and we married in college! I met my husband in high school. I was 15, he was 16. Dated for seven years, married twenty-seven! My husband and I both love to cook and eat! And we love that I found your site! Your refried beans have become a staple as well as several other recipes! My husband and I met as he was leaving from and I was going to a job interview. We locked eyes and smiled, but never spoke. Neither of us landed those jobs. A few weeks later we found ourselves sitting side-by-side at another job. When our eyes met, we remembered that first encounter a few weeks earlier. I know it sounds cliche, but fate pushed us together! My hubs and I met our freshman year of college. I thought he was loud and obnoxious. Fast forward to our senior year, add a lot of growing up to the mix, and I was hooked. I met my hubs online… though not through a dating site. Sometimes it does work! High school sweethearts….we are celebrating our 37 wedding anniversary on Wednesday :). I had known my husband since we were six, but we had not seen each other in 12 years. I was working for a yacht brokerage in Ft Lauderdale; he was working for a Senate campaign. My Dad had told me to contact his parents; his Mom said he should call me and that was that. We were married for 31 years with 2 kids before he died of a heart attack. I still miss him – he made me laugh. The interest that defines me is my love for writing. I love to write short stories and poems. It is who I am. I met my spouse at Blockbuster Records! Not Kidding! My favourite hobby is cooking, I love to feed my loved ones. I am a baker, and I come from a long line of bakers, and I have 4th cousins still living in Germany who are professional bakers. Baking is in my blood. When I first read “Artisan Bread in 5 Minutes a Day,” I had dreams of all the breads I could make. I met my hubby in college over 20 years ago. Thank you for the wonderful giveaway. My hobbies include painting and gardening and I love to travel. I met my husband through a friend–she had dreams of marriage and he thought they were just friends. She was wrong, she married someone else, and he ended up marrying me and we’ve been happily every aftering for forty-two and a half years. How I met my husband will not seem strange unless you know us. A little background: my nickname in college was MOM. I was the one who was responsible, made sure everybody was safe, and usually was the one my roommate called at 2 in the morning to pick her up because she had been drinking. My husband’s initials spell D.A.D. He is also the responsible, not into drinking type. We met in a bar. I had decided to go with my roommate since I would be getting a call to pick her up anyway and figured I could drag her home early. I was not drinking. He had stopped by to visit some friends who were leaving to go out for the night, so he went with them reluctantly. He was also not drinking. My husband and I lived across the hall from each other in college. one of my hobbies is photography! i love it and i really think it is one thing iwas born to do! I love baking and cooking for my friends and family. I always enjoy seeing others devouring what I’ve made and asking for more. Thanks! I met my husband at school. I met my husband when he was a head rehab director at a hospital and I was on my clinical. Just new friends! We went our seperate directions for almost 6 years with no contact. We re-met through email (my saving grace an old business card ~ I still carry now as my lucky charm) and then Facebook. It’s funny how the man /or/ spirit upstairs works! He is truly the love of my life and he is loving my experimenting w. all your recipes! Your site has inspired me! My husband and I met in college marching band. The first day of band the announcer always tells the students to look around the room, most likely they have spotted their future spouse. But wasn’t it, it was when I asked his friend to a dance and his friend said yes (and didn’t know who I was!). My husband was the wing man to get his friend out of the date. I went home and told my high school friend I’d met the man I was going to marry, he just didn’t know it yet. He kissed me this morning, wished me happy birthday and then pulled the covers up over my shoulder and told me to get some more sleep. Still in love. PS – it’s my birthday – pick me!!!!! Drive-thru at McDonald’s is where we met…1984. I worked there – it was my senior year in high school. He seemed to come through every single day…large diet coke…always. What I did not know at the time was he was only going through when he saw my car there. He eventually asked me out…we are both rather shy and awkward around new people….was married in 1988 after I graduated college. We have one handsome nineteen year old son who is in college. I met my hubby at work. I’ve recently started getting into event planning for non-profits. It’s a lot of work, but also fun and satisfying. and moved to another state. We were married for 25 yrs. My husband and I met while working at an old fashioned hardware store during college. I met my hubby online when I was fourteen! We followed each others’ blogs for several years before connecting on Facebook, which was followed by two years of constant conversation and discussion, which resulted in use becoming best friends, before I finally met him in person. We’ve been married for three months now and although our relationship wasn’t typical, I wouldn’t have done anything differently. I met my hubby at a work-related event. Family defines me and everything that means. Cooking, gardening, my people, my dogs. I could stay home for months on end if someone would bring me groceries and toilet paper. My husband and I are homebodies, too. I need to suggest this pizza for our next date night. We met almost 9 years together at Paneras Bread, where we both worked. One afternoon he called the store to talk to another girl, and asked her out. It was that moment that I made up my mind that he was going to my man. 9 months later we were engaged. My husband’s grandmother babysat my sister and I when we were little. After moving back to our home town after college and becoming best friends, it turned into a relationship and we’ve been together for 4 years and married for 2 months! I met my husband at a frat party the night before I started school. 8am Calc class! We married 4 mos. later. next month is our 41.5 year anniversary! met at a frat party the night before school started. 8am Calc class the next morning. Married 4 mos later. Next month is our 41.5 year anniversary! I was training for my first ultra-marathon and my running partner said he knew a “running legend” in the ultra community who had run this race many times and reached out to see if he’d be willing to run with us and give me pointers. So on a Wednesday morning at 5:30am, I pulled up to the trails and watched a blonde, curly-haired, blue-eyed man with the best beard and sweetest smile come bombing down a hill on his long board and stopped when he saw me and said “Hi, I’m Jamie.” We ran that morning together and I left already in love. He ended up coaching me and I won that race and the rest is history. He is the greatest man I’ve ever known and he makes my life so beautiful and colorful. Every day is an adventure. My better half and I met on the Internet. In the beginning, we were friends and I was giving him dating advice. I have to talk about the pizza. You are a temptress and I love the Fritos on top. You have inspired me. Love this pizza! And the story of how you met your husband. I met my hubby at a church’s coffeehouse they had every Saturday night. My friend dragged me there (I didn’t want to go because I am shy) because she wanted to meet a guy and I went along for the ride. My first night there I met Nick! I thought he was so sweet and we were just friends for 6 months before we started dating. Photography is a hobby that defines me. Through the lens of my camera, I aim to capture the beauty of the world around me. I LOVE that story about how you met your hubby!! I’ll have to tell you mine one day! Food coincides so much with a memory of a special place and time, love it! This pizza is nuts. I need it! Being active through exercise defines me because I was a competitive runner and skiier. 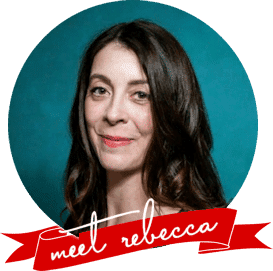 I met my husband, at a bar, introduced by his ex-brother in law – yikes! Imagine that one. Strange but true. I met my husband in 1999 at a concert through a friend. We will be together for 15 years on November 21st! We got married in Vegas in 2007. I love the story on how you met your husband!! I actually met my husband on myspace hahaha oh my word and then in person for the first time at a restaurant I worked at called Rockola. He came in the night before his 21st birthday (I remember because I wouldn’t serve him beer haha. I met my husband through choir. I was singing, he was the pianist. So I LOVE this story about how you meet your husband. Music is very much a part of our lives as well, so is pizza. We have pizza night once a week in our house! Something our family as a whole looks forward to! So would it be weird if I joined you two for date night so I can have some of this awesome pizza? Okay wait for it…I met my husband when I was in grade school. He was going out with a girl who lived down the street. She introduced us, and his name was a bit odd. Everyone calls him C’Paul. So he told us he got that nickname because he was born on a boat. Sea’Paul, ya, gotta love him. We met again about 2 years later and became best friends. Didn’t date until about a year later. I still laugh about him being born on a boat. We bought it hook, line and sinker. I met my husband in a college film class. I heard him speaking French to his college French TA, so I assumed that he was French and oh so exotic. On our first date I continued to ask him about France until I finally realized he grew up in Minnesota, just like I did. We still both love movies! I love tis recipe. Pizza and tacos are favorites around here, too, so mashing them together is a brilliant idea! I met my hubby in high school and through my cousin. We were high school sweethearts and will be married 20 yrs in October. One hobby, it would probably be yoga to me. My wife and I met in High School many, many years ago! I posted a tweet: https://twitter.com/FireRunner2379/status/506862235269230592. The hobby that defines me is sewing for kids in need…it is my passion. First things first – THIS PIZZA OMGOOOOOOOSH! LOVE! Second: My husband lived across the street from me for 18 years and we never ever met. The night we met he happened to be on my side of the street. I was rude to him, I turned him down when he asked to drive me like 50 feet to a grocery store. He chased after me and 18 years later we’re still together. I met my husband at work. A hobby that defines me is gardening! i met him at work 25 years ago; didn’t like him at first, but he persisted, and i guess, he grew on me; we have been together ever since. I am a potter (or pottery artist) and find that this hobby defines me. Taking clay and creating something useful and utilitarian has become an outlet for my artistic side. Currently in my life I take great interest in being a Mother. I’d say at this point in my life it defines me and I’m happy with that! My passions and hobbies have always been writing, music and travel! I love all three equally. I am pretty defined by my love of theatre. My husband owned a small local bar. I met him at their famous “spaghetti night”. We were set up by relatives. I met my husband randomly in a bar in germany. My husband & I met at a friend’s wedding – thank you. I met my husband in japan! I met my husband at a concert in 1999. We’ve been together ever since. Can’t believe it will be 15 years in a couple of months. My composing and playing music is probably what defines me a lot. I can’t tell you how my spouse and I met, since neither of us really knows–we both were involved in the local music scene and hung out at the same bar. I don’t think we ever officially “met.” So let me answer your alternate question! 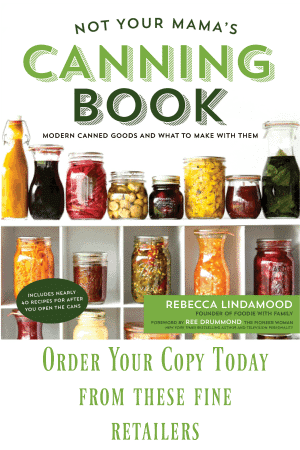 Cooking (including baking and canning) is the one hobby that defines me. It’s what I do. I feed people. And I feed pets, too. But because I enjoy it, it’s a hobby and not a chore. I met my husband during college, we had all the same classes and sat next to each other in every single one and yet we didn’t talk much until almost the end of the semester. We became very good friends, spent every moment together ( he was also my neighbor) everybody saw something more than a friendship , everyone said we were meant to be for each other but we couldn’t see it until one night it hit us, we were in love long before we discovered it. We’ll be celebrating our 10th anniversary in November and I am so blessed and thankful to God for my husband. My hobbies are kind of all over the place but I would say jewelry making. I love to create new designs and pieces. I’m particularly fond of chain mail and working with jump rings. I met my husband in middle school Scholar’s Bowl (our quiz bowl team). And yes, we’re still that nerdy. I met my hubby in high school during my junior year when his mother introduced us three times. LOL She was my typing teacher and he came to my school just for his senior year after spending his real senior year in Sweden. I actually met my husband in first grade. Our class picture is on display in our family room 🙂 But we did not begin dating and eventually marrying until meeting back up after college. I met my husband while he was on leave from the Navy. We were having a wedding shower for his sister and she introduced us. We were married just 5 months later. I meet my significant other in high school. Cooking and baking defines who I am, I love experimenting and creating new things! I met him at work and it was love after that.